This is the second post in a series, exploring the “Gingerlime Tasting Technique” ™. You can read some background on the previous post, where I explain the motivation, testing method and how I started exploring A/B testing for coffee. Different tasting sessions comparing two types of beans and trying to choose the best out of the two. The first tasting was between coffee A and B (still unknown to me at this point in time). The test was actually a series of 4 different tasting sessions. Each session used a different method of making coffee: Hario V60 filter, Espresso, Aeropress and a Cappuccino. The attempt in each session is to compare the beans. 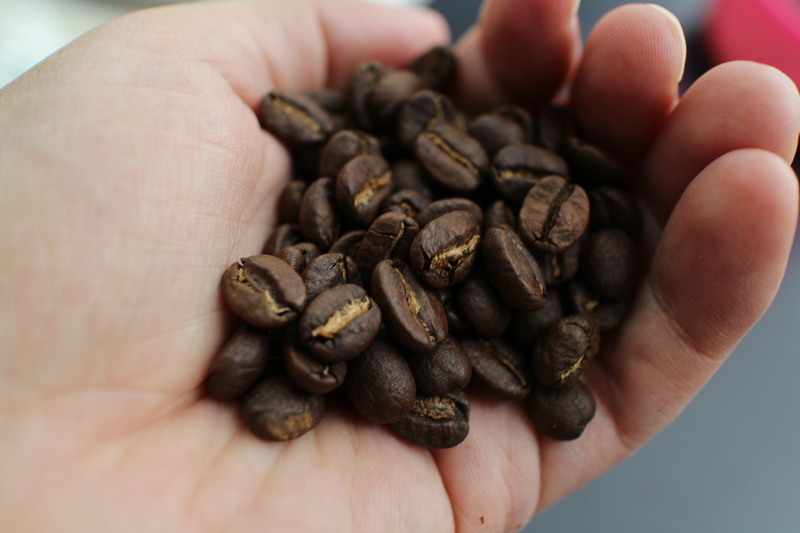 Reducing variations in other parameters as much as possible to allow tasting both coffees at the same time. This may sound simple, but it’s not entirely so. The temperature of the coffee makes a big difference. If one cup of coffee is ‘waiting’ whilst the other one is being prepared, the temperature of each coffee will be slightly different. 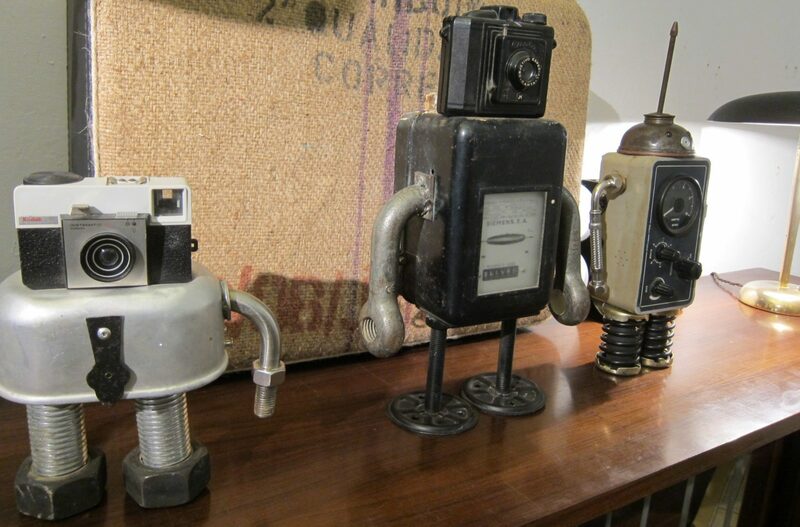 Each type of bean behaves slightly different when you grind it, making coarser or finer grind. Nevertheless, I tried my best to keep consistency, without being too fanatic. This is not exactly science. I did use the same grinder, tried to use the same cups, filter paper and measure the same amount of coffee for each portion. I also tried using roughly the same amount of water or milk (when I added milk), but those weren’t measured precisely. 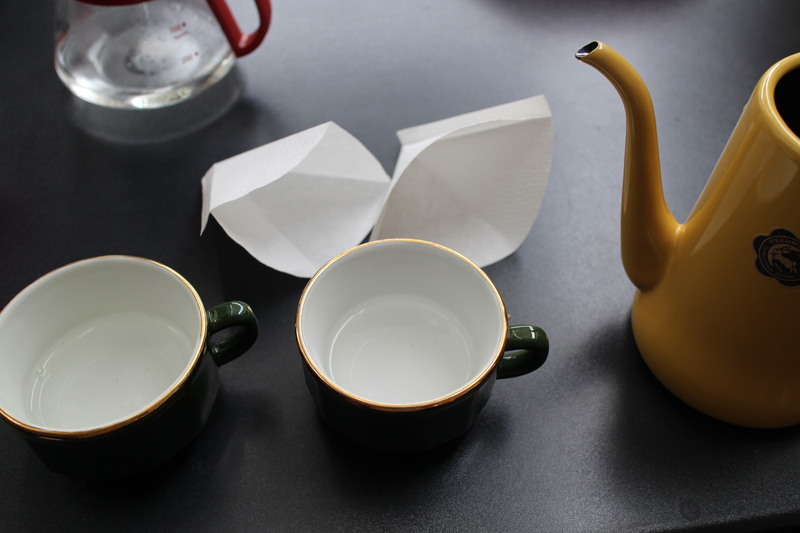 Time was also important, trying to make two cups in succession but with as small gap as possible. 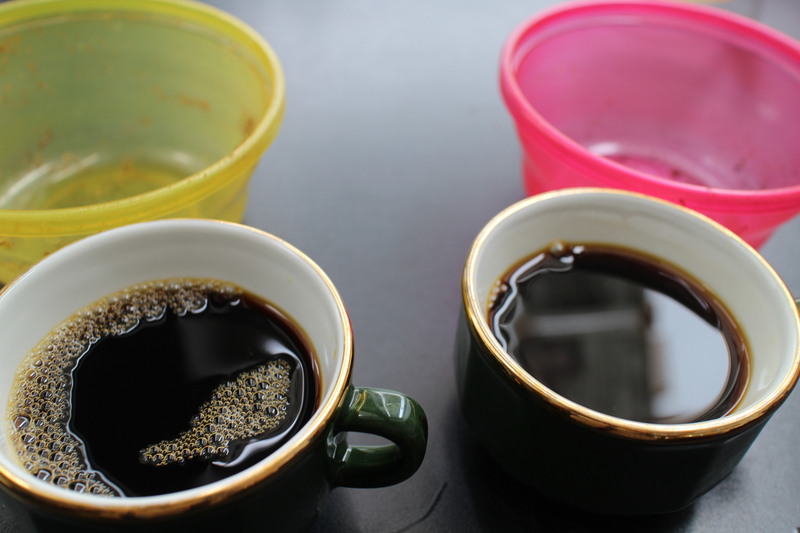 Water makes a big difference in how coffee tastes. I discovered it when visiting Japan. The water there is very soft. I live in Berlin, where the water is very hard. The difference is pretty significant. I now try to use a mix of Britta filtered water and distilled water (more or less 50% of each). This softens the water. Perhaps in future I will try some soft mineral water. The important thing however is to use the same water for both cups. I only recently started drinking filter coffee more regularly. Without milk. I did find that the flavours are much more present in filter coffee than with Espresso. It does take some getting used to however. It’s almost like drinking tea. 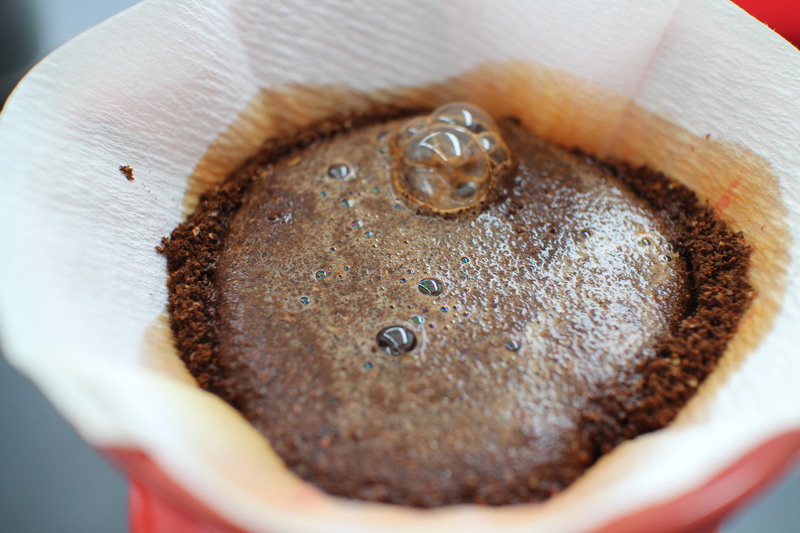 The first test was therefore using the Hario V60 filter. 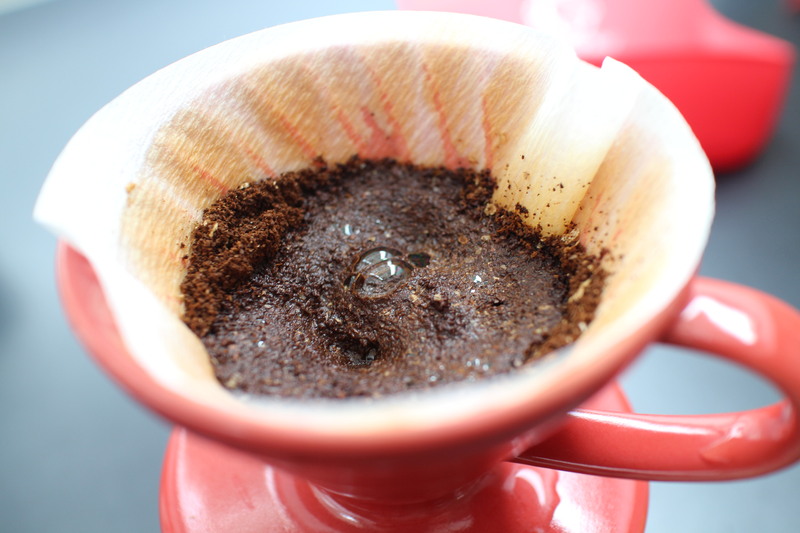 I used one ceramic coffee dripper and swapped the paper filters. I normally ‘wash’ the paper filter first, to get rid of the paper taste. In this case I thought it would make it more difficult to swap the filters since the paper sticks to the surface of the dripper, so I didn’t. I did warm the dripper and the pot, as well as the cups beforehand. You can see the A and B beans in the photos. I tried to smell them when opening the package, and could already sense some difference. Variation A seemed a little more earthy and B more fragrant and fruity. I don’t really know enough about coffee to make a much deeper distinction. I ground 19 grams of beans from each bag, using the same grinder setting. 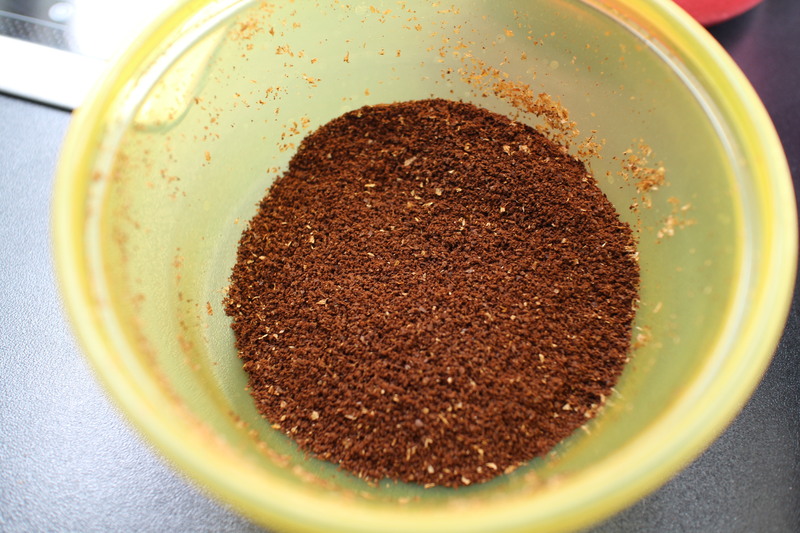 I tried my best to remove any coffee from the grinder beforehand and between the two types, but of course it wasn’t 100% free of leftover coffee. I use a Macap M2M stepped grinder, which I have set to coarseness of 7. The difference in smell was naturally more noticeable after grinding. 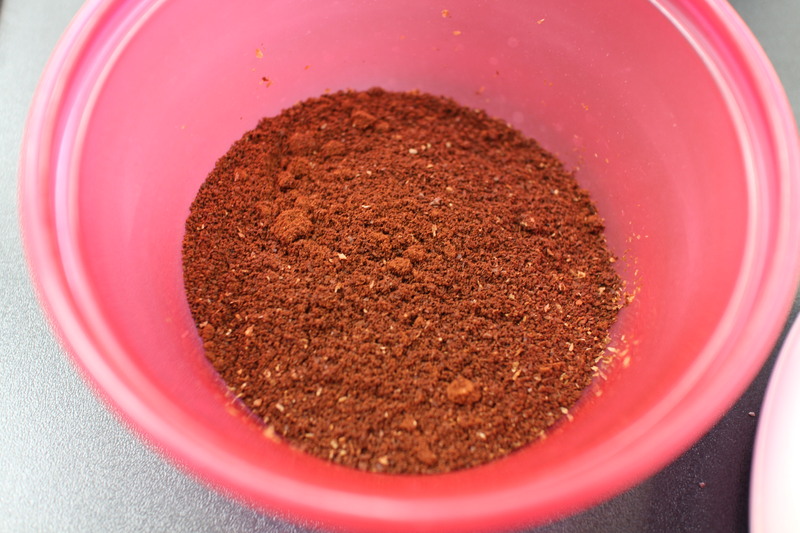 I placed both ground beans in a small plastic container. Admittedly it wasn’t the perfect container for taking photos, because each container had a different tint, so it’s hard to judge the natural look. I’ll try to find a transparent container next time. Letting each cup bloom (a new term I only recently learned) for around 30 seconds, I already noticed some difference. Variation B seemed more ‘fluffy’ and the water seemed to sink in faster somehow. 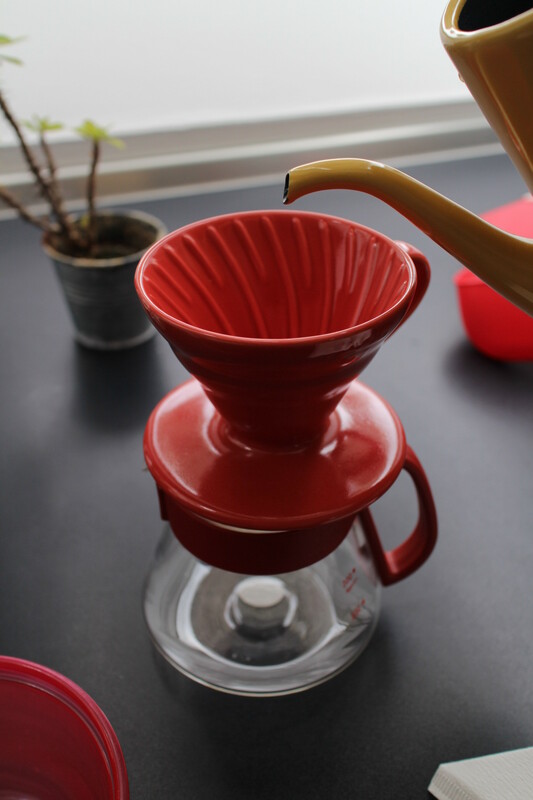 Blooming is when you pour over just enough water to soak the ground coffee, but not enough for it to start dripping. You see some bubbles forming during this process. I’m not exactly sure what’s the reason for doing this. I couldn’t spot any visual difference. The small bubbles were just because I just poured the coffee from the pot (A’s bubbles disappeared at this point). I doubt those bubbles mean much. In terms of flavour, I could say that my pick is definitely B. It really had some nice flavours (almond? or some fruit?). Coffee A in comparison felt more bland and flat. It felt more coffee-y, whereas B had those tea-like properties that I like in filter coffee. Sadly, my wife wasn’t feeling so well and didn’t want to taste. Later on, she did take part of the tasting. Her instinct and taste buds are probably better than mine. She always surprises me with her comments. More on that in future posts. 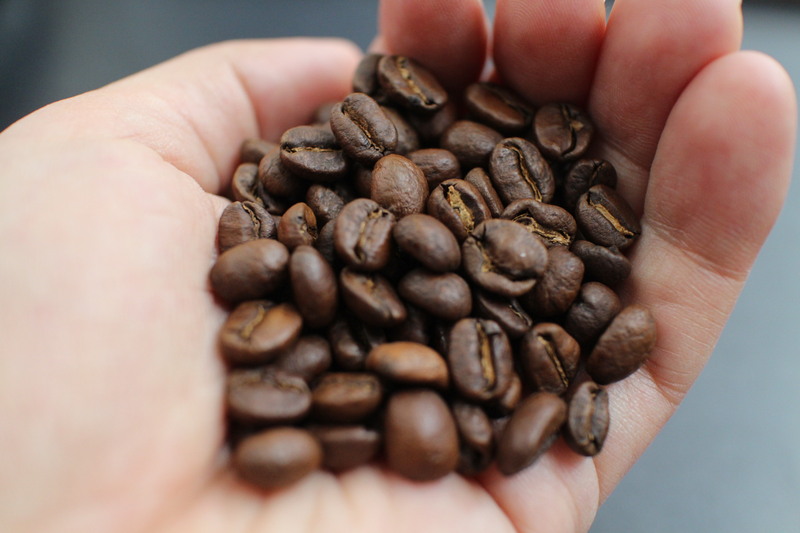 On the next post I’ll tell you more about the next tasting round – Espresso. Stay tuned for more. But check the caption! I gave you credit for it. Am I forgiven? Since you asked so nicely and gave proper attribution, I’d be delighted to have this photo featured on your page. I’m glad you enjoyed it.